Content based on a Tisch College Civic Life Lunch given to professors, staff, and students at Tufts University. Join us for a conversation with LaDonna Brave Bull Allard & Cutcha Risling Baldy. LaDonna Brave Bull Allard is the Historian and Genealogist for the Standing Rock Sioux Tribe. Allard is also the Founder and Director of the Sacred Stone Camp, a spirit camp established in April 2016 that has become the center of cultural preservation and spiritual resistance to the Dakota Access pipeline. Cutcha Risling Baldy is the Assistant Professor of Native American Studies at Humboldt State University, where her research focuses on #IndigenousHashtagActivism and #TheNewNativeIntellectualism and how Indigenous people are engaging in #HashtagActivism to achieve social change. Social media has transformed the way people communicate and relate to the world in the last few years. It has been applauded as a unifier and simultaneously criticized as “fake news,” as a realm where people lose touch with reality and get trapped into a world of likes and retweets. Could it be that social media is actually the great equalizer? Could social media really be a platform that empowers the people to broadcast their truths to the world while mainstream media and “the news” continue to ignore or distort them? 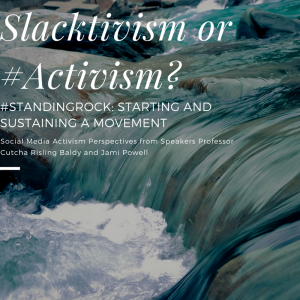 If you ask Professor Cutcha Risling Balding, she’d tell you that social media, especially Twitter, makes a huge impact on the growth and success of a movement, as seen at Standing Rock—one of the most widely recognized and recent cases of blatant environmental injustice. Risling Balding studies #HashtagActivism of social justice movements and believes that there is no such thing as “slacktivism.” As she explained at the Civic Life Lunch, there is no harm done by retweeting and liking posts that elevate and amplify indigenous voices which are so often silenced. Often, people seeing these posts get inspired and feel empowered to do something to stand in solidarity, even if locally. These actions can have a huge impact, pushing the mainstream media to actually cover movements on the news and even calling out the President to come out with a public stance on an issue. Calling these actions “slacktivism” diminishes the importance of movements that are seen as “indigenous issues.” The reality is that water protectors at Standing Rock, organized by young indigenous women, put their lives on the line to protect water in the Missouri River from pollution because “Mni Wiconi,” “Water is Life”—a universal truth for all living beings. Access to clean and safe drinking water is a human rights issue facing many communities in the US, disproportionately communities of color. Social media enabled millions of non-native people to become allies and engage with the Standing Rock water protectors through retweets and likes of their posts, checking in at Standing Rock on Facebook, watching live videos and pictures as evidence of the police brutality and militarization. All of this shaped the narrative of what was occurring at Standing Rock, instead of it being entirely decided by distant, out of touch, and inaccurate media and government reports. This so called “slacktivism” caught the attention of media outlets and politicians who were now pressured to address the sovereignty rights of the Sioux tribe in the construction of the Dakota Access Pipeline. News outlets began to invite and speak to indigenous people involved with the #NoDAPL movement. This #HashtagActivism as brought the movement to decolonize Native American tribes and the United States one step further. 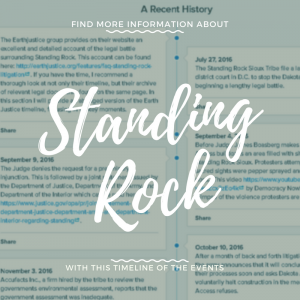 Through social media, activists at Standing Rock have spread awareness to the public of the real, living, contemporary indigenous people and can further shape the narrative of these social movements.